Towards strengthening solid friendship bonds: Morocco’s King Mohammed VI (right) and French President Francois Hollande. Analysts say Hollande’s visit to Morocco is political and economic in nature, as France seeks to develop relations with its biggest trading partner outside the EU. Middle East Online (Rabat, Morocco, April 1, 2013) – French President Francois Hollande’s first visit to Morocco, on April 3-4, is being carefully planned for by French and Moroccan business circles. Hollande will land in Casablanca, not Rabat, accompanied by French business leaders, all hand-picked by the French employers’ organisation Medef International. This visit comes at a very crucial juncture for the French Republic which launched on January a military intervention against the extremist militant groups, affiliated with AQIM, to recapture the northern part of Mali. Morocco supported the French intervention in Mali to fight terrorism in the Sahel and the Sahara region. Analysts have noted that the visit carries a political and economic nature, as France seeks to develop its relations with its biggest trading partner outside the European Union. The state visit is also an opportunity to strengthen the solid friendship bonds between the two brotherly nations and to highlight the long standing and special partnership that marked their relations for decades. In this occasion, the two Heads of States will discuss regional and international issues of common interest, especially the ongoing war on Mali and the threat of security in the Sahel region. The Sahara conflict is likely to be discussed in relation to the latest developments on the grounds, notably that the Security Council of the United Nations will hold its yearly session for the possibility to extend the MINURSO mandate. It is worth noting that this is not the first meeting between the two Heads of States. 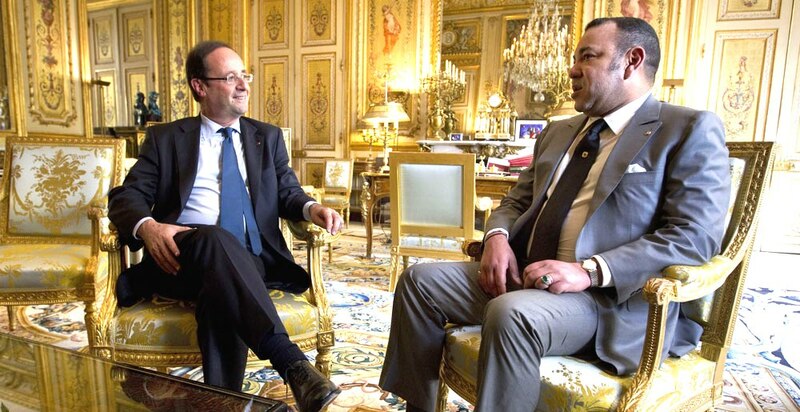 King Mohammed VI held a private visit to France on May 24, 2012, and was the first Head of State welcomed by François Hollande at the presidential palace since the inauguration of the latter on May 15, 2012.